I'm unable to reproduce with Pinta 1.1 - were there any specific things you did before zooming out, such as using a certain tool or brush? no, i just load image, and use "ctrl" button keyboard and scroll of mouse to zoom out. > you did before zooming out, such as using a certain tool or brush? 1. Open Pinta and click on New icon from toolbar. 2. In New Image dialog type in 5 for both Width and Height and click on OK button. 3. Press <Ctrl> and press "-" many times (in my case 5-times) or scroll mouse wheel to zoom-out the image. Canvas gets out of control - if you zoom in many times the image on canvas is no more visible. If you switch to some other program and switch back to Pinta the canvas does not get updated. Pinta is in freeze state. This problem only happens with very small images. It zooms-out and zooms-in with big pictures without a problem. 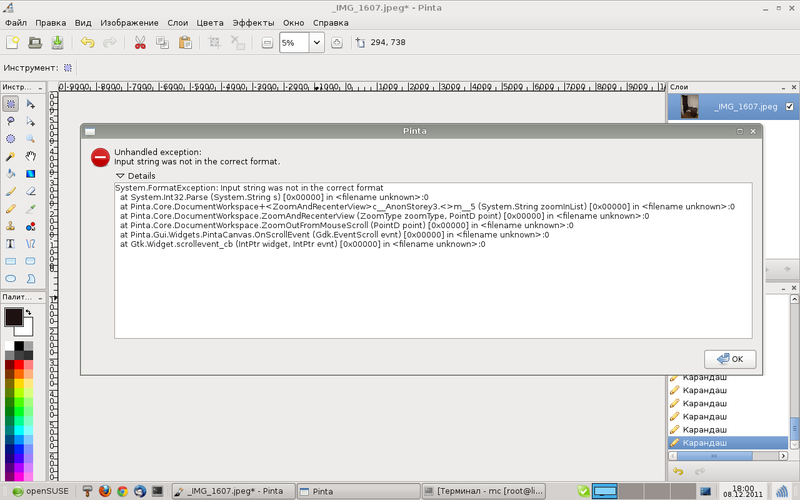 john-16, can you please download Pinta 1.1 and try if this problem behaves like in my case or if it produces the error. First check Help | About there should be an info of Pinta 1.1 (so you are running new 1.1 version) and then please recreate the steps that produces the crash. Please also it would be nice if you could provide more detailed step-by-step instructions how you reproduced the problem (something like my steps above). What is your image height and width? The last version in old releases archive is 0.8, so 1.0 is missing (0.9 was never released there was jump from 0.8 directly to 1.0). Administrator, can you please update older releases web page with 1.0 version. I have installed Pinta 1.0 on Ubuntu 11.10 from official Ubuntu repository (removed PPA) and the problem is the same as in #4, I can't reproduce john-16 problem . The only difference is <ctrl>+mouse wheel does not work (if I am not mistaken mouse wheel was added during 1.1 development cycle), but <ctrl> and "-" key is working, but as described Pinta somehow freezes. After this issue appears, try adding new image 1000x1000 and you will see no image on canvas. So Pinta actually does not freezes, but starts to behave in useless "mode". i use Pinta from openSUSE repo( rpm package), now a get and install from source 1.1 version - my problem is solve. > was never released there was jump from 0.8 directly to 1.0). john-16, thanks for update. Developers I still think we should investigate issue from #4 step-by-step instructions, because I still think it is a bug. This was happening because byt a certain point the canvas size was being calculated to less than 1, which is rounded down to 0 as an int. Fixed by enforcing a minimum size of 1 x 1 px for the canvas and not allowing zooming out beyond whatever percentage where that happens.